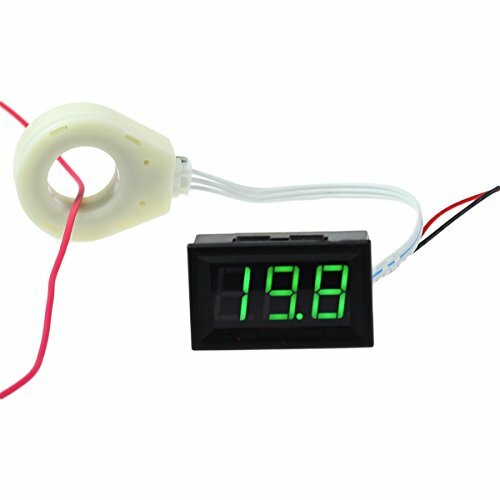 bayite Hall effect current meter reads current by detecting the magnetic field around the wire, there is no electrical contact which eliminate risk to delicate monitoring equipment and also minimizes safety concerns. The sensor doesn't get hot like the current shunt sense resistor which can have thermal temperature heat dissipation issues. As the resolution is 0.3A, the current reading might be flickering with 0.3A difference. For example, if the current is 1.7A, you might see a 1.7A and 2.0A alternatively. This is normal. If your signal is too weak or you are not getting the resolution you want, you can coil the wire through the current sensor as many times as you want to double, triple, or quadruple the sensitivity or resolution. For example, if your current signal is only 0.2 Amps, you could loop the wire through the sensor 10 times and the signal would by 10X stronger and would appear as 2.0 Amps.